A VT Ski Lodge Wedding at Riverside Farm is a dream to attend. A VT Ski Lodge Wedding does not always mean a winter wedding, especially with the myriad of beautiful venues that Vermont has to offer. Riverside Farm is one of the premier wedding event locations in the New England area, with its blend of city chic and country charm. The authentic farm is located in Pittsfield, Vermont and is only a few miles from New England’s most prominent ski resort, Killington Resort. This proximity to Killington makes Riverside Farm an ideal wedding spot for couples who share a love of skiing, snowboarding, and other winter-weather activities. This picture shows some of the farm’s scenic grounds, along with a creative wedding decoration. IN the background of the photograph, green foliage spreads below the blue sky. The perfectly manicured grounds of Riverside Farm run from a wooden porch to the Vermont woods that surround the property. On the porch of one of the venue’s renovated barns stand two antique skis. The skis are old and made of wood, with rusting buckles where, once upon a time, skiers would place their feet. 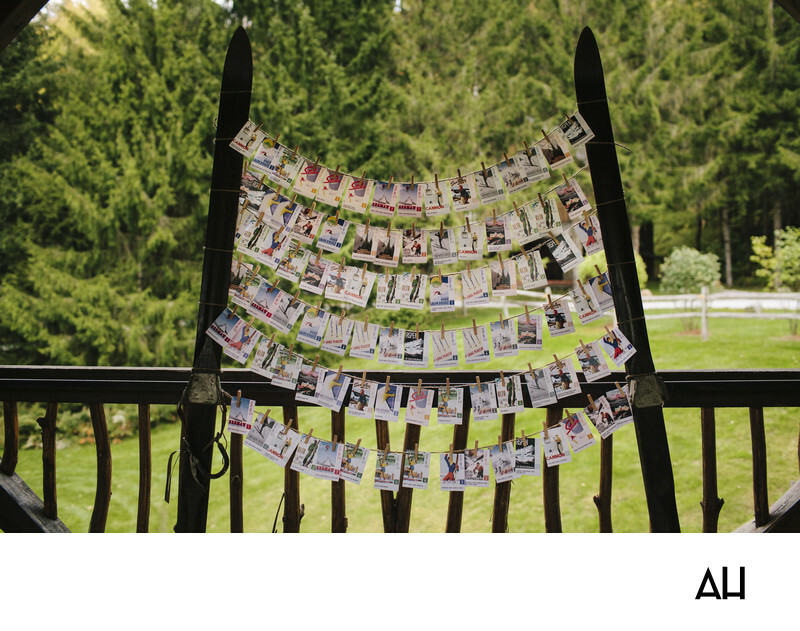 Between the skis, six rows of wire hold tiny clothes pins that present ski passes from every time the bride and groom have ventured up a mountain together. The passes are sentimental tokens of the fun the couple has had together and the partnership that exists in their relationship. Today, the bride and groom will begin a new adventure, and instead of ski passes, they have wedding rings.